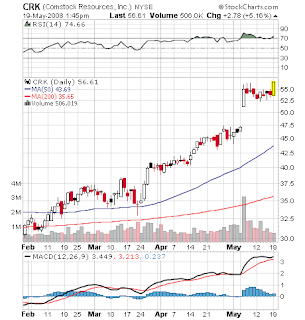 I bought CRK on today’s breakout, using a buy stop with a limit place just above the consolidation area. I too am curious about that vinay. My query is about when playing a breakout, how do you decide when to sell out? Do you watch intraday for any weakness or do you just set a target? I have been looking at some myself recently but where there is no previous high, how does one judge when to sell out? Two examples which I had on my watchlist were ZOLT and AAP which broke out as I expected but I dont know how one would identify a target price.Like vinay, I find the blog a real educational tool. I dont see the point in copying your trades as it is not sustainable for a trader to just copy somebody! What happens if you were to stop tomorrow!